The Volkswagen Golf SportWagen has easy release fold-down seats that allow you to increase the cargo space when you need to. Folding down the seats will give you 66.5 cubic feet of extra space. It also has roof racks that will allow you to store even more gear. It is up to you whether you need to haul people or things. 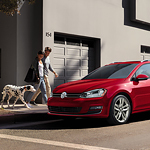 The SportWagen gives you a choice. Next on the list is the 12-way adjustable power driver’s seat that allows you to get just the perfect fit. When it comes to safety, the Adjustable Cruise Control will allow you to maintain a distance from the vehicle in front of you that you choose.